We were delighted to welcome two distinguished guests in to work with our oboists last week. On Tuesday 21st, performance skills specialist, Karen O’Connor (pictured left) gave a group class and also worked with pupils individually. Karen was Principal Oboe of the City of Birmingham Symphony Orchestra (CBSO) for over 25 years. Whilst carrying out her busy performing schedule, Karen began to investigate how elite performers like professional musicians, might learn from the mental training regimes embraced by sports psychology, and develop the skill of mental toughness, such that performing under pressure is something to be anticipated and planned for, not feared. Her investigations have subsequently led her into a ground-breaking area of work with professional and student performers. 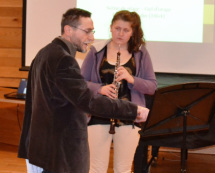 On Friday 24th, composer and oboist, Gilles Silvestrini gave a masterclass which included performances of several of his Six Etudes, based on impressionist paintings. From 1990 to 1996, Gilles was Principal Oboe of the Symphony Orchestra led by Laurent French Petitgirard. In 2000, he was admitted to the Casa de Velasquez as a resident, then in 2002 at the Abbaye de la Pree. He currently teaches at the Conservatoires of Champigny-sur-Marne and Villeneuve-le-Roi. He has written many chamber works and concerti as well as virtuoso works for solo oboe. With many thanks to Melanie Ragge for organising these classes.